The hybrid cellular-WiFi carrier Republic Wireless is launching a new budget device this month, and it's a good one. The 3rd generation Moto G will be available for purchase from Republic on October 27th in both 8GB and 16GB versions. The pricing isn't as competitive as past Republic Wireless phones have been, but the Moto G is a crazy-good deal already. The new Moto G has a Snapdragon 410 SoC, a 5-inch 720p LCD, and Android 5.1 Lollipop. It comes with either 8GB of storage and 1GB of RAM or 16GB of storage with 2GB of RAM. Both versions have a microSD card slot as well. Republic Wireless is selling the phone for $199 (8GB) and $229 (16GB). That's a few bucks more than the standard Motorola price, and you can't customize it through Moto Maker—it's just basic black or white phones. However, the rear shells can be swapped. Republic Wireless offers plans as low as $5 per month with calls and texting over WiFi only. The plans go up to $40 per month for 2GB of LTE data and unlimited calls/texts on WiFi and cellular (it runs on the Sprint network). The plans with mobile data also offer account credits for unused data. Note: Republic Wireless PR says the $40 plan still exists, but that was not our understanding previously. Your mileage may vary. The product page for the Moto G is live, but you can't pre-order yet. You can check out all the plan details in the meantime. FYI, the more expensive Moto G is worth the price with double the RAM. 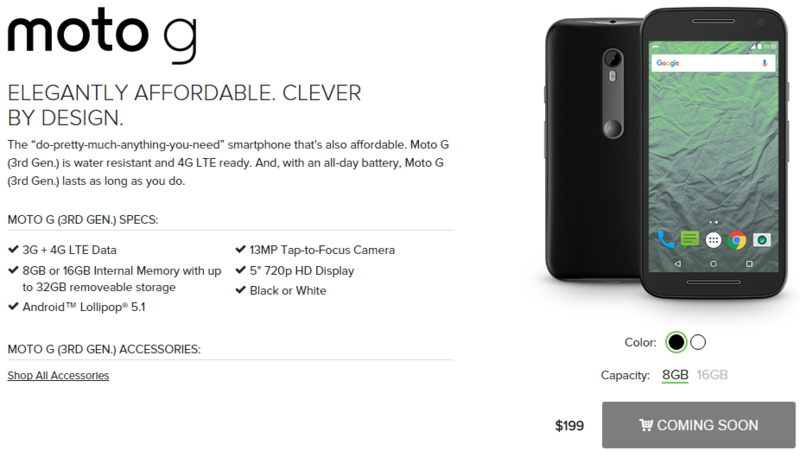 So, it looks like Republic Wireless is carrying a different version of the Moto G than expected. The CDMA 16GB variant only has 1GB of RAM, but the regular GSM/LTE Moto G 16GB has 2GB of RAM. That's surprising considering it's more expensive than the unlocked Moto G, and this is a pretty bad deal.